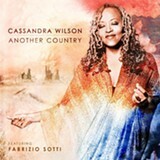 Cassandra Wilson is one of the primo jazz singers of her generation, melding influences of Betty Carter, Abbey Lincoln, and Joni Mitchell for an approach that's distinctively her own. She's wrapped that dusky contralto around assorted standards, but Another Country is her first album of original songs. The context is acoustic guitar (which is the main focus, with the occasional smattering of electric), accordion, bass, and percussion. Country takes its cues from folk-oriented performers who have been heavily impacted by jazz, such as the aforementioned Mitchell, Tim Buckley, Kenny Rankin, and John Martyn. The ambience is sultry and summery, closer to an outdoor cafe with a view of the Mediterranean than a nightclub. The opening track, "Red Guitar," finds Wilson delicately but assuredly wrapping her voice around lyrics in the vein of Martyn, driven by subtly bluesy guitar chords and bits of bittersweet, shimmering sustain over an undulating, samba-ish beat. "Almost Twelve" has some nice wordless singing and an accordion sighing forlornly in the background, executed over a grooving, bubbling bossa nova tempo. "When Will I See You Again" evokes the angst-laden Parisian cabaret of Edith Piaf. It's got a radiant guitar solo with subtle Django Reinhardt undertones and such a laid-back, languid rhythm you'll think you're bathing in a tub of warm nostalgia. "O Solo Mio" is an old (1898) Italian song, yet Wilson makes it a sublime ruminative meditation, drawing a direct line from Naples to Memphis.